Mr Oe san and the sample book handed down from his father. 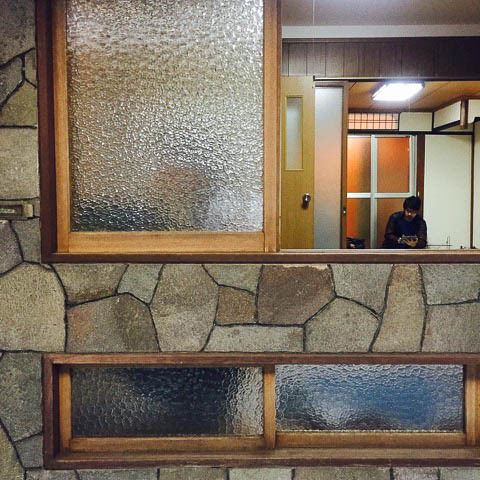 Our studio is located in a traditional style house over 70 years old in the central area of Kyoto city close to Kamo River. 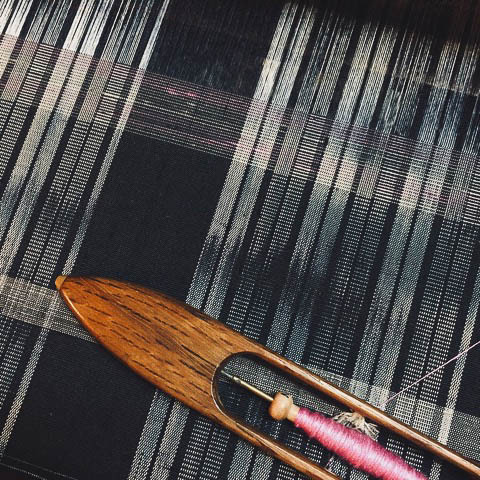 We have space for weaving, showroom and exhibition. 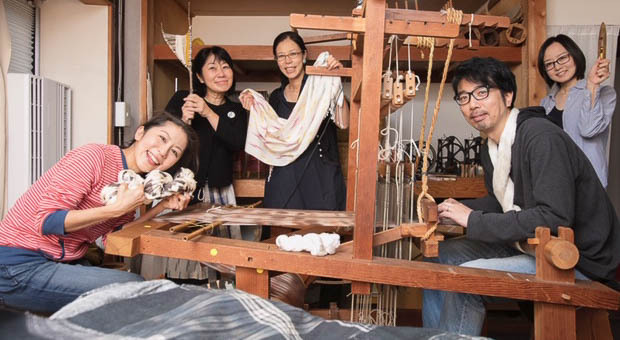 Three of our members, Shiro Oe (representative director, textile producer), Ikuko Kasai (craftsman of ikat) and Miki Sirasu (writer) started this unit in October 2014. 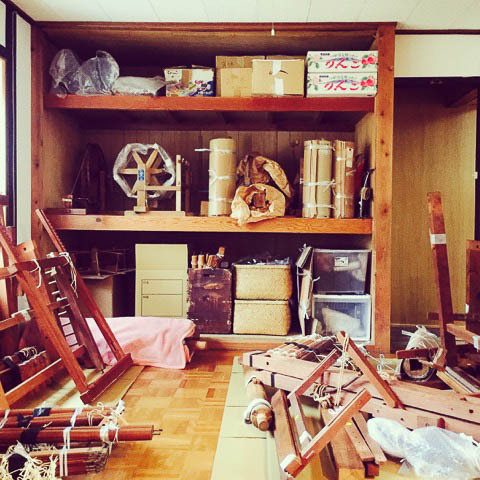 Yoko Okabe (dyeing artist) joined the unit end of that year. After 2015, our studio has started through a crowdfunding campaign. 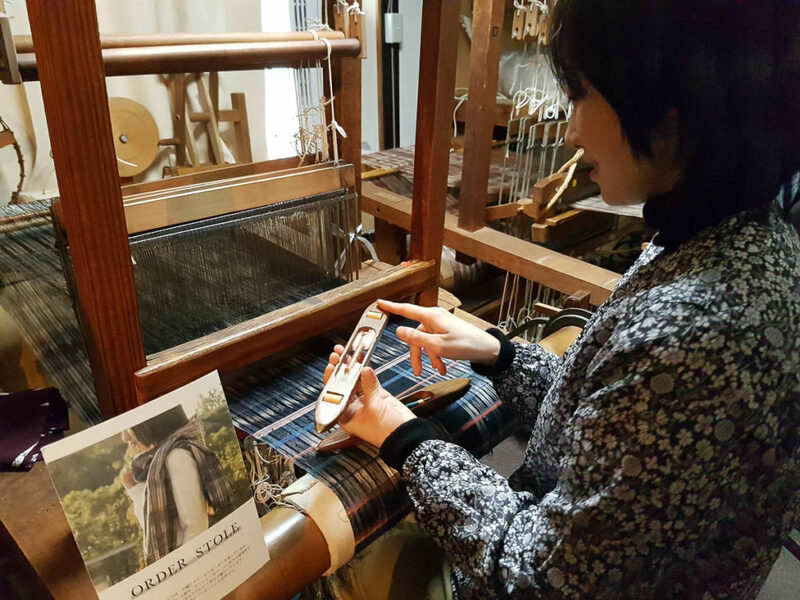 I, Namiko Tatezaki (weaver, planner) joined since then and we have been supported by some weavers and creators from outside. All of us believe in the power of yarn, textile, and handcrafts. This is our style, so Itohen universe is the place to express and show them. We all members have day jobs as weavers, craftspersons, writers, artists and housewives, etc. So we can gather to our place only at nights and weekends. We often work there for private projects and meeting whenever we need. 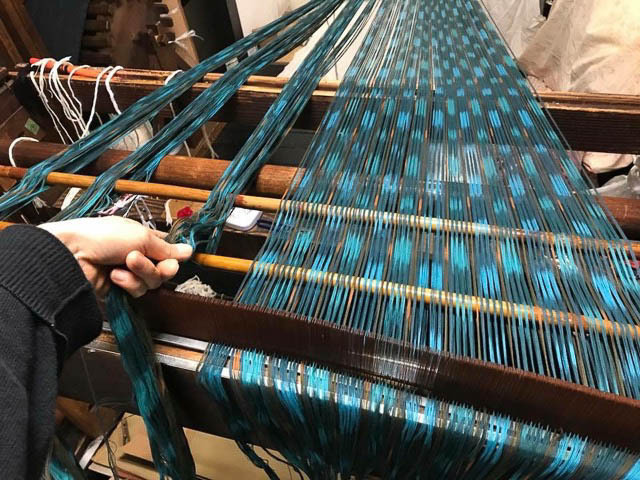 Our activities include hand weaving, dyeing, planning original textiles and products mainly with Nishijin-ikat as well as workshops, events and publishing a magazine. Our priority is not only making products with traditional techniques. Telling and showing about our works and stories is very important, the same as creating. We all have many kinds of experiences, skills and connections each so we can make all things happen. Stoles are our standard products. It involves design on the warp yarn and is easy to take naturally for everyday life. Silk is standard for this technique, but we use all kinds of materials like cotton and wool. Some people think that silk is too difficult to launder at home. However, it is not true. We also advise customers how to keep good condition and quality of silk. In addition to that, we offer semi-custom order stoles. The customer can order length and colour. 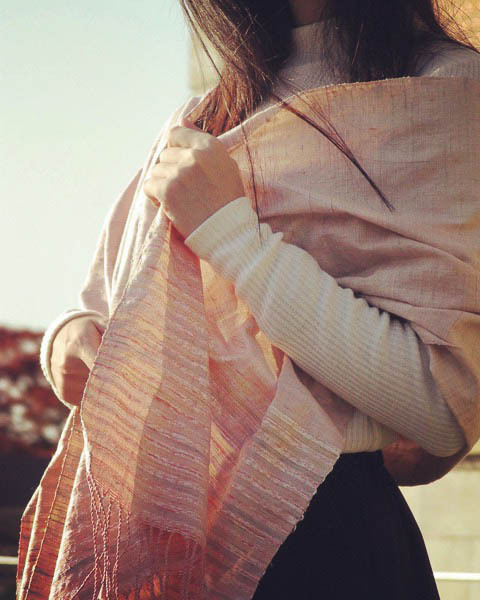 We weave exactly only-one of the woven stole. 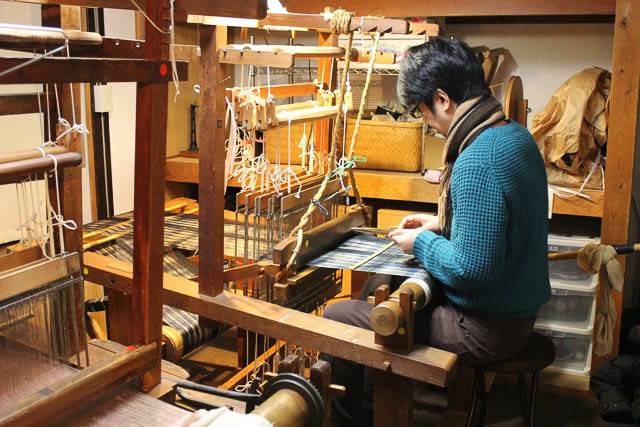 Even it sounds heavy and pressured work, but at the same time, it makes weavers motivated and excited. Today, we have collaborated on projects with creators from outside of our studio, such as the fashion brand Zukan. 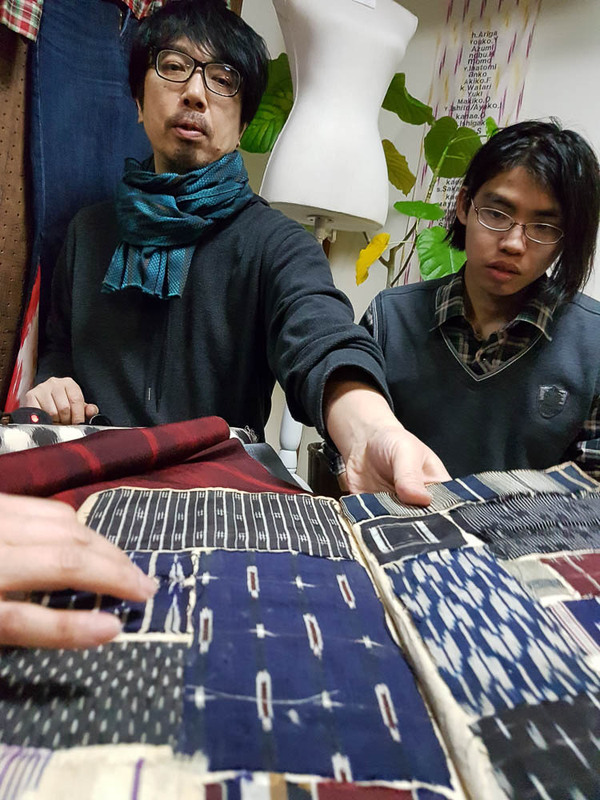 Designer, Taro Murakami has combined our textiles in his project. It is very unique and fresh: small pieces of ikat are designed for daily clothes. 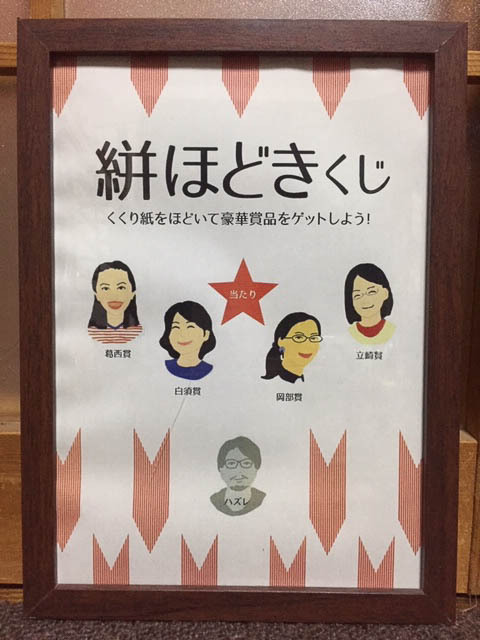 Cartonnage designer, Michiko Miyamoto (boxstudio85), has made glasses cases and business card cases which are popular as a gift. We can make them feel fresh and discover the new style which no one produces in the market. We hope our collaborations with professional make something new and excitement together. We also have the popular accessories named “hashi＊ito” which are made from small pieces of cloth leftover from the process of making products. However, there are amazing technical originalities in these pieces, even if they are tiny. These are broaches and earrings by special trimming of patterns and colours. They are one of a kind. 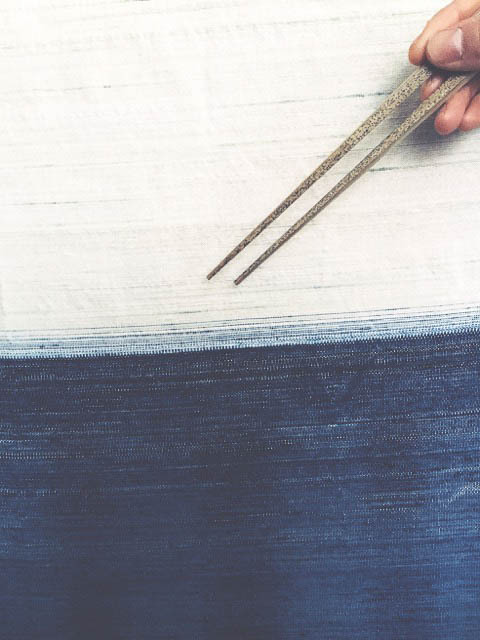 Shirasu writes and reports for our magazine named “ito.coto” about weaving and dyeing. What we enjoy doing for the magazine is planning, designing and shooting in-house. 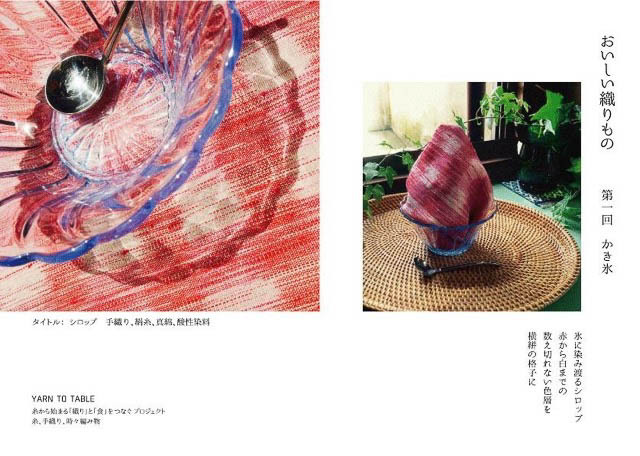 I have my project in the magazine named “The taste of weaving”. 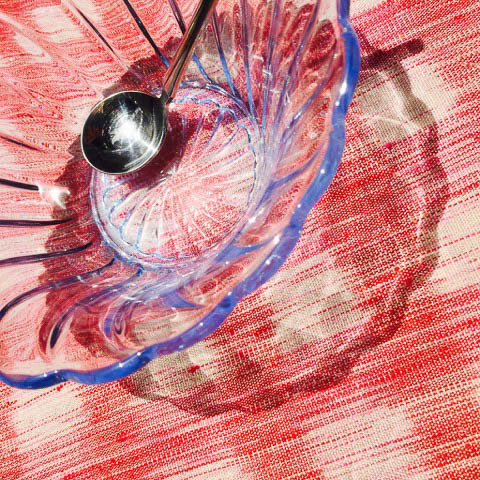 I get inspiration from foods, so I weave and set styling and shoot by myself which makes me so excited. The first issue was successful and the second one is coming soon. We have an “open studio“ every second Saturday to meet the general customer. It is not only to show and sell our product. We would many people to see our demonstrations and talk about our creativity face to face. It is a very good opportunity for us to get to know people who are interested in our work from different industries and communities, which make us motivated to the new activities. Lately, guests from foreign countries are increasing in number. For us, it is a really good opportunity to know their opinion regarding traditional craft and our creativities. In fact, we joined the event Design Week Kyoto in Hong Kong in October. Hong Kong people were very excited to watch our demonstration of traditional techniques and textiles for the first time. We also had a talk session with the local creators. We were very fascinated to get know each creation and experience. Hopefully, we will have a new collaboration with them to pursue something new. People’s lifestyle, fashion, economic…these are not simple today. People are looking for something special, which are one of a kind, with originality, quality, uniqueness, etc. We always try to have a good understanding to reflect their feelings. At the same time, showing spirits of traditional handcraft are our key point. Today’s fashion and tradition make us study and improve our works. Our studio has just started and our style is very flexible. We want to keep going. Main job and family are our priority. Connecting people is the most important. We accept all works from all industries. Our products are ageless & unisex. Quality is our priority. Our original doesn’t have any deadline and set-up price. Go our own way rather than polish someone else’s apples. Be nice and keep the rules of our neighbours. Stock coffee and snacks all the time.